Never mind that there seems to be no polar icecap… What caught my attention is that a few months ago, Google Earth didn’t really “show” the North Pole. It just showed a smeary blob of white that looked like a bad Photoshop job of covering up something. So I started looking around, and I found a few articles. I’ve been having a lot of intuitions about this planet lately, and some very interesting dreams, and frankly, I was a little disappointed not to see a hole there. After all, Admiral Richard Evelyn Byrd (born in Virginia, as Ghost Radar likes to remind me) made an expedition to explore the South Pole, “perhaps” for military purposes, and in his personal diary (which of course is subject to dispute since it was discovered after he passed) he described passing through a hole there, into a world unknown to “man”. He also described meeting and conversing with “The Master” while there. Edmund Halley apparently proposed holes at the poles in 1692, according to Bill Knell. 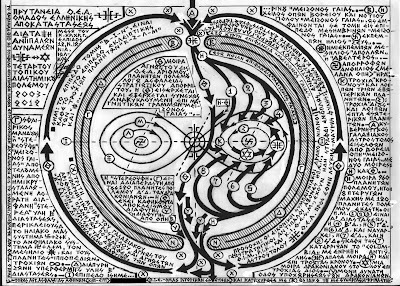 This diagram describes a hollow earth almost identical to the one I was guided to sketch a few nights ago. The original article is no longer available at Op Ed News (http://www.opednews.com/articles/The-Hollow-Earth-Hollow-M-by-Bill-Knell-081209-782.html), so the sources can’t really be checked. So I kept exploring the topic, curious to find out whether my sketch and the information I was receiving from Teo’Na was similar to any other information on the Internet. The iron isn’t pure—scientists believe it contains sulfur and nickel, plus smaller amounts of other elements. Estimates of its temperature vary, but it is probably somewhere between 9,000 and 13,000 degrees Fahrenheit (5,000 and 7,000 degrees Celsius). Above the inner core is the outer core, a shell of liquid iron. This layer is cooler but still very hot, perhaps 7,200 to 9,000 degrees Fahrenheit (4,000 to 5,000 degrees Celsius). It too is composed mostly of iron, plus substantial amounts of sulfur and nickel. It creates the Earth’s magnetic field and is about 1,400 miles (2,300 kilometers) thick. “Earth’s north magnetic pole is racing toward Russia at almost 40 miles (64 kilometers) a year due to magnetic changes in the planet’s core, new research says. From a blog post on The News Scientist, I found an article from August 13, 2007. The article scrapes the iceberg of disputes over “landrights” in the area. After some more Googling, I finally found the old Google Earth images of the messy North Pole that I was initially looking for. In a thread on Above Top Secret (abovetopsecret.com), Kathy T posted a reply (on 25-2-2009 @ 09:13 PM by KathyT). That thread hosts a discussion about a holes at the poles. She makes the same point with the photos, that they look altered. Jan Lamprecht from South Africa has become known for his research into the Hollow Earth theory. This link will take you to an hour-long YouTube video on Lamprecht and the Hollow Earth. Within the first 8 minutes, he explains that his interest began when he came across stories of scientists proposing that the moon is hollow, and perhaps fabricated by intelligent beings (a spaceship). The presentation is fascinating, as Lamprecht describes just a portion of his research, and offers some science about how the planets are actually most likely hollow! This area was considered to have “indrawing seas” with currents that pulled ships northwards. It was said that 4000 people disappeared in this manner. There are several images of maps available to Internet search that indicate lands – of varying types – north of Alaska, in particular. Lamprecht and others also refer to indigenous legends of mysterious lands to the north. However, as Lamprecht notes, all of these land masses no longer appear on contemporary maps. Lamprecht even cites a recent incident of a scientist traveling to an area north of Alaska and taking photographs of a land mass. When the scientist referred to maps to understand what land he had seen, he could not find any land indicated in that location on maps. The current Wikipedia article on the North Pole explains that since there is no land mass, and the ice over the north pole is constantly shifting, it’s practically impossible to pinpoint the geographic north pole. And since the magnetic pole is shifting, any claims to a precise location would be suspicious. For more information, please check out the Beneath The Surface page.